Tech Week for the Upper School Musical this year was threatened by some heavy snowfall and a variety of cold weather ailments. The possibility of school shutting down on Thursday due to the snow threw several cast members into a panicked frenzy. People were falling sick and some Tech Crew members had to drop out of the show as a result. Thankfully, most of us pulled through the week unscathed. SIA’s production of In the Heights was a success, the kind that occasionally brings tears to your eyes but mostly makes you want to dance and sing. 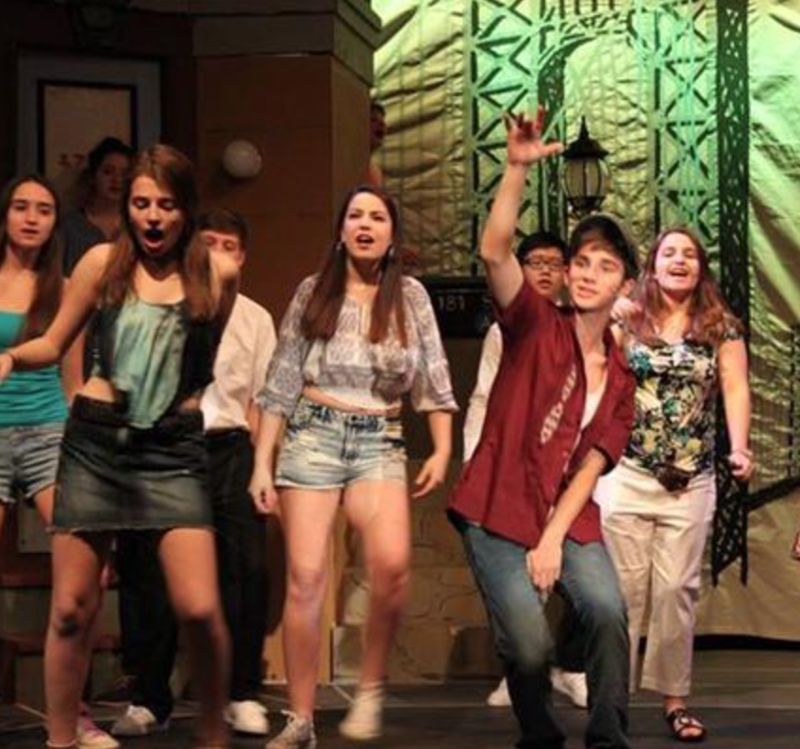 In the Heights is unlike any musical we’ve done in the past few years – and in a good way. While I loved How to Succeed in Business Without Really Trying and Mame, it was nice to work on a show that takes place in this century. I also appreciated the fact that we told a story that empowers and celebrates immigrants, those underrated people who identify with more than one nation, speak more than one language fluently, and understand that making a dramatic move from one corner of the world to another is a step that never goes out of style. Often, they started with nothing in this country but chased the American dream anyway. Sounds a lot like my parents. My friends’ parents. Probably your parents or grandparents too. The story is set in Washington Heights, New York, featuring the interwoven lives of multiple characters. Their community is changing irrevocably as gentrification forces many people to sell their small businesses and move out of the neighborhood. A central figure in el barrio is Abuela Claudia – she is the grandmother and guiding star of everyone in the community. One of the show’s most moving scenes is when Usnavi, the bodega shop owner and narrator of In the Heights, announces Abuela Claudia has passed away. The entire neighborhood gathers around her door to honor the life she lived. It is a moment that feels real and sadly familiar. Many of us have someone like Abuela Claudia in our lives. Many of us have experienced the loss of someone like her. In the end, we can only celebrate and honor the lives that have touched us – they always brought light to the darkest moments. Alexa Fodera ’16 gave a strong and moving performance as Abuela Claudia. Her interpretation of the show’s most important (and difficult to perform) role was one to remember. Senior Danielle W. ’15 shined onstage starring as Nina Rosario, who took a leave of absence from school after struggling through her first year at Stanford. Danielle’s big solo, “Breathe,” sounded lovely, as well as her duets with Nina’s love interest Benny, played by Jahir H. Jahir tackled his role with a ton of energy – along with some great dance moves. 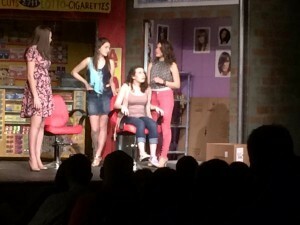 Alex V. ’15 played Nina Rosario’s mom, Camila, convincingly well – even her costume was the most realistic. She did a fantastic job of bringing powerful emotion (and motherly exasperation) to her solo, “Enough.” Claire C. ’15 as Carla brought a dash of humor to the production with her memorable lines, “What would Jesus do?” and “Doesn’t it feel good to spread Jesus’ love?” Her onstage banter with Yvonne’s character, Daniela, was hysterical. Speaking of memorable lines, Graffiti Pete, played by Trip M. ’17, walks away with the prize for Best Sales Pitch: “Yo, what up? Buy my t-shirt!” The aforementioned t-shirt was a hideous gray thing that looked like it had been stained with strawberry-kiwi Trix yogurt. Chris C. ’16 and Ryan D. ’16 also gave compelling performances as Piraguero (Piragua Guy) and Sonny, respectively. The audience loved Chris’ solo “Piragua” and most importantly, laughed at all the right moments, while Ryan played Usnavi’s immature younger cousin Sonny with striking realism. Of course, one cannot talk about In the Heights without mentioning its star, Usnavi, played by Dan B. ’16. Like Vanessa, Usnavi is a nuanced character who goes through a variety of emotional situations but manages to pull through in the end and discover his real home in el barrio. Most of Usnavi’s songs are in rap form – he narrates the story of el barrio and each of its inhabitants. Dan did a wonderful job of guiding the audience through this rich, complex musical while capturing the emotional highs and lows of his character. Despite our differences, the core of our stories is inherently the same. Every moment, no matter how raggedy, is worth remembering – just like the words and faces of our loved ones, the walls of the places we’ve stayed. 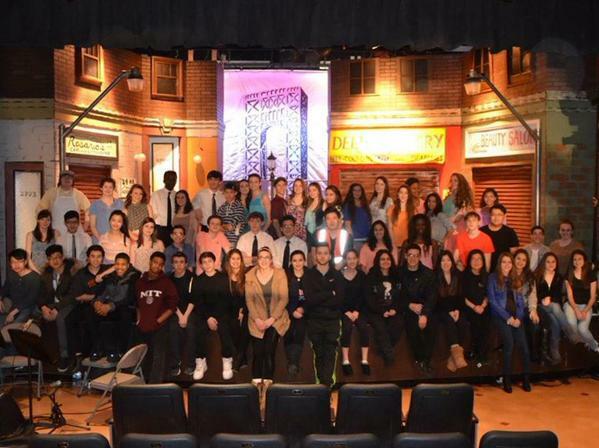 Whether you live in Washington Heights, Brighton Beach, or Todt Hill, you can relate to the lives and trials of each vivid character featured in the musical, In the Heights. There is not a single moment in this show, with its breathtaking lyrics, loveable characters, and catchy music, which falls flat. While the immensity of this project may have seemed discouraging at first, the cast and crew rose to the challenge. They brought energy and dedication to every scene, making it a memorable experience for both themselves and the audience. This entry was posted in The Arts on March 15, 2015 by The Quill Editors. This article originally appeared in the Winter 2014 print edition of The Quill. Every year for the past 11 years, Staten Island Academy has held a House Holiday Decorating Competition. This competition usually takes place on the first week in December and the five houses take around two weeks prior for planning. In the competition, each house is assigned a holiday and decorates two windows and a portion of a wall in the Commons. This year, Stettinius was assigned Hanukah, Methfessel received Christmas, Partington got Chinese New Year, Willard-Mundorf got Kwanza, and Merrick decorated for Diwali. On the windows, each house uses window paint to paint the windows with things that relate to the holiday they were assigned. For example, this year Stettinius got Hanukah so they painted a dreidel in blue and white, colors often associated with the holiday. On the walls, houses use various materials, such as wrapping paper, lights, and anything specific to their particular holiday, to represent their holiday. This year, the houses all chose to perform during the house decorating to represent their holiday. There was dancing, singing, and music to represent Diwali, Christmas, Chinese New Year, Kwanza, and Hanukah. Some houses also brought in sweets and treats commonly eaten during the holidays. All in all, this year’s decorations in the Commons are among some of the best ever displayed in the Commons. The windows and walls are a friendly reminder that the holidays are approaching quickly and they show our SIA holiday spirit. We would like to congratulate Merrick House on winning the House Decorating Competition and Methfessel House for earning the most Spirit Points! This entry was posted in Community on March 15, 2015 by The Quill Editors. At SIA, Mrs. VQ enjoys getting to know a variety of students, from her Spanish classes to fellow members of Stettinius House. If you haven’t done so yet, I would encourage you to stop by her office to chat, whether you want to brush up on your Spanish speaking skills or just talk about the latest movies. The two that Mrs. VQ looks forward to seeing the most are Horns, starring Daniel Radcliffe, and Mockingjay, the most recent in the Hunger Games series. For one glorious week, I became immersed in the world of my favorite Shakespeare play, A Midsummer Night’s Dream. I laughed at the bumbling Mechanicals who, try as they might, could never get their act together. Each night, Flute the bellows mender would appear in a vision of pink, calling for his lover in a falsetto voice. Whenever Snug the Joiner would scratch his head and murmur, “I am slow of study,” I commiserated in his plight, thinking of my own struggle with mathematics. Every rehearsal was a new adventure, unfolding the story of earnest lovers, droll Mechanicals, and a splendid fairy kingdom. The world of A Midsummer Night’s Dream was transformed one detail at a time – more lights, a new song, a sudden twist in an actor’s routine. From my place in the back of the auditorium with sound, lighting, and stage manager, I had an almost perfect view of the events happening onstage. I wondered if my classmates could also feel how magical it was to bring A Midsummer Night’s Dream to life. Tech Week is the championship game of the theater world. You work for three months on a production, and you only have two chances to strut your stuff. The pressure was on. It was my senior play, and at that point in time I didn’t know whether or not I’d ever be in a non-musical production again. Everyone was stressed. We cried, we laughed, and we were delirious. The cast and crew were running on three hours of sleep, our teachers expected us to have our homework done, and we were all trying not to have mental breakdowns. Tech week brings out the worst in us, but that’s theater, and that’s our family. Whenever I needed a breather, I sat in the audience and watched Akash D. ’15 kill himself on stage and Claire C. ’15 bring out an aggressive side that no one knew existed. John H. ’16 developed the nickname “Hunky Hannan”, and Ryan D. ‘16 is now forever known as the kid who got slapped by the most timid girl in school. Sitting in Shakespeare class freshman year, I never would have imagined putting A Midsummer Night’s Dream on stage. Now, as a senior, I can’t imagine this production going any other way. The exotic fairy kingdom and modern human world merged to make an unforgettable version of the show. I can only hope that my fellow cast and crew members had as much fun as I did. From start to finish, A Midsummer Night’s Dream was all about making connections. We, as actors, needed to connect with each other before we connected with the audience. This entry was posted in Student Life, The Arts on March 15, 2015 by The Quill Editors. This entry was posted in Student Life on March 2, 2015 by The Quill Editors.